PATEK PHILIPPE SPLIT SECONDS CHRONOGRAPH MINUTE REPEATER YELLOW GOLD Patek Philippe & Cie., Genève, No. 112161, case No. 230818. Sold on September 20th, 1905. Made in 1901. 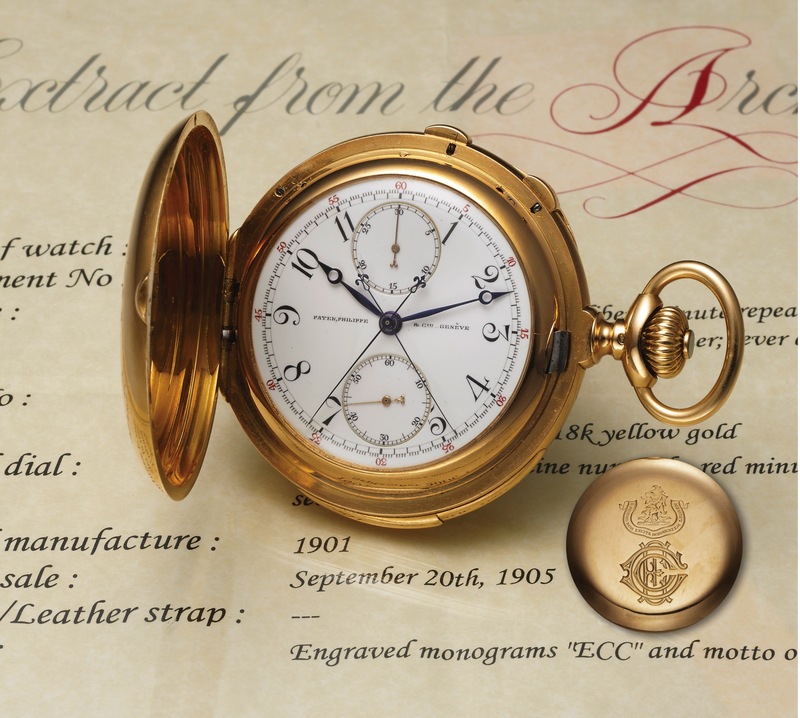 Very fine and extremely rare 18K yellow gold keyless minute-repeating hunting cased pocket watch with split-seconds chronograph and 30-minute register. Accompanied by an Extract from the Archives. Four-body, "bassine", polished, front cover engraved with initials ECC, the image of a lion and E SOMNO NON EXCITA DORMIETEM LEONEM, 2 push buttons in the band for start/stop chronograph and the split-seconds functions, triple hinged, cuvette engraved JJC to Edward Chester Center, Sept. 1905. White enamel with painted radial Breguet numerals, outer 1/5th seconds track with 5-minute/seconds Arabic red markers, subsidiary sunk dials for the seconds and the 30-minute register at 12. Blued steel Breguet hands. Cal. 18```, nickel silver, fausses côtes decoration, 38 jewels, straight-line calibrated lever escapement, cut-bimetallic compensation balance with Breguet balance spring, swan-neck micrometer regulator, repeating on gongs by activating slide in the band. C. Four-body, "bassine", polished, front cover engraved with initials ECC, the image of a lion and E SOMNO NON EXCITA DORMIETEM LEONEM, 2 push buttons in the band for start/stop chronograph and the split-seconds functions, triple hinged, cuvette engraved JJC to Edward Chester Center, Sept. 1905. D. White enamel with painted radial Breguet numerals, outer 1/5th seconds track with 5-minute/seconds Arabic red markers, subsidiary sunk dials for the seconds and the 30-minute register at 12. Blued steel Breguet hands. M. Cal. 18```, nickel silver, fausses côtes decoration, 38 jewels, straight-line calibrated lever escapement, cut-bimetallic compensation balance with Breguet balance spring, swan-neck micrometer regulator, repeating on gongs by activating slide in the band. Dial, case, cuvette and movement signed. DIAM. 56 mm. THICKNESS 18 mm.